After eight years of working at the Museum I am finally moving on to teach at a local school in Pittsburgh. The video above does a good job of demonstrating my experience at the Children’s Museum of Pittsburgh. I spent a lot of time having fun, trying new things and meeting new people (and sitting on the floor). I have been around since before MAKESHOP started. 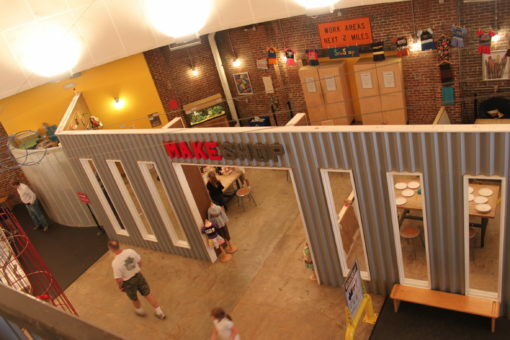 From it’s humble beginnings in the Garage exhibit MAKESHOP has been a place where families, students and staff can try new things and explore real tools and materials in an environment that values the process as much as the product. I could probably write a book describing all of my experiences in MAKESHOP and the Museum. But for this final blog I think that I am going to keep it simple. I got to work with an amazing and dedicated team of teachers, artists and researchers during my time spent in MAKESHOP. I only hope the best for all of them and I hope the space continues to inspire and encourage kids and adults to try something new. I learned how to use a sewing machine in MAKESHOP. I learned how to use power tools in MAKESHOP. I learned how to make circuit blocks in MAKESHOP. I learned how to solder in MAKESHOP. I learned how to use a laser cutter in MAKESHOP. I learned the importance of counter sinking screws in MAKESHOP. Most importantly, I learned how to be a teacher and a learner in MAKESHOP. I still haven’t learned exactly how magnets work.